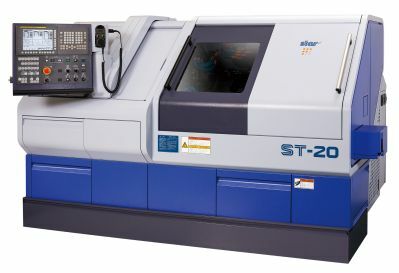 Roslyn, NY-based Star CNC Machine Tool Co. offers the ST-20/ST-38 Swiss-type sliding head lathes with three turrets. These machines are designed to process components with high complexities which require a large number of tooling for various operations. Quick-change tooling system is used with offline presetting for fast tool change. The three (3) independent turret design allows for three (3) tools in a cut for faster production. Two (2) turrets are used for the main side operation, with "Z" axis on the front turret, while the third turret is used for the back working on the sub-spindle. Both main and sub-spindle are equipped with a variety of tooling for ID, OD and any live tooling for operations required to complete the job. These machines have rigid design, excellent capability, high precision and high productivity for great profitability. Both are equipped with proprietary Star Motion Control System for higher accuracy and easier operability. ST-38 is designed for complex machining of large diameter components. Designed for seamless multi-processing to the highest specifications and functions, Star CNC Swiss-type automatic lathes are known for precision machining of complex medical components, aircraft parts and those components made from tough materials like stainless steels and nickel-based super alloys. The proprietary Star Motion Control System significantly reduces idle machine time. The ST-20 and ST-38 videos below demonstrate the capabilities of the simultaneous front and rear end working and 12 axes which provide the machine's complex machining capability, making them some of the most advanced sliding head lathes available from Star CNC.